I hate it when old geezers post stuff that young people never experienced and will never ever understand. Notwithstanding that, I will engage my inner hypocrite and slither down memory lane. 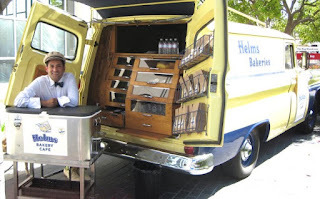 One of the cool things about Saturday growing up was the Helms Bread truck. It showed up early in the morning (often interfering with Johnny Quest or other important cartoons), and honked the horn on our street. Helms sold bread, but they also sold doughnuts. The cooler held bottles of milk on ice, that were colder than those bottles left earlier in the morning by the milk man. (in that era, there was no such thing as a "milk person") The best thing about morning delivery milk was the four inches of cream on the top of the milk. And if you were quick and very clever, you could innocently pour all of that cream onto your Wheaties, before anyone was the wiser. Times have past and that sort of service will never be seen again. Today you'd worry about he Helms Bread truck selling marijuana out of the back or sneaking various opioids to addict America's youth. They'd take flat screen TV's in trade for drugs. That sort of thing. 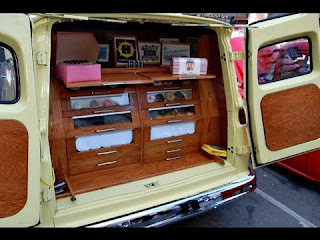 Today you'd need to armor the driver in a steel cocoon to keep him (and the drugs) from being carjacked by a rival gang. Drivers would need to be armed. When I was a kid, the milk man dressed in white and wore a bow tie. 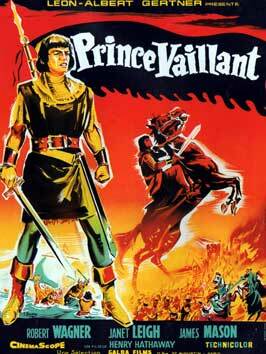 In that time, you had to worry more about neighborhood boys taking your trashcan lid and using it as a shield in mock medieval sword battles after the kids saw "Prince Valiant" or "Ivanhoe" at the movie theater. Today it's more a matter of virtual sword fights on X-Box.